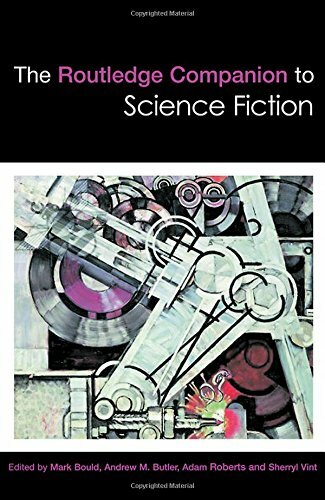 The editors of The Routledge Companion to Science Fiction are to be highly commended for assembling a superb team of contributors and producing a volume that is both an outstanding work of reference in its own right and a comprehensive guide to science fiction and the scholarship surrounding it. This is a book which will last, informing and challenging scholars at all levels for many years to come. Its success will not be measured simply in sales or the number of subsequent editions, but in the work it will inspire as SF continues to grow as an academic field. The Routledge Companion is divided into four parts: "History," "Theory," "Issues and Challenges," and "Subgenres." While the "History" is impressive, and will be returned to later in this review, it is the "Theory" which anchors the book within academic discourse. I am aware that this claim is open to misinterpretation. For example, it might be taken in some quarters as meaning that the theory section first alienates lay readers through abstract attempts to make it look as though SF writers were actually motivated by abstruse theoretical concerns; then further compounds the alienation by deterministically reading these external concerns into the story; before finally excluding non-academic readers completely through the use of impenetrable professional jargon. However, nothing could be further from the case. Not only are these pitfalls avoided, but the relevance of theory to SF and, crucially, SF to theory is so clearly established that it will be impossible for any general challenge to ever be taken seriously again (although specific cases will remain open to debate, as we shall see). Presumably the editorial briefs for contributions to the theory section stressed the need to demonstrate such direct and mutual relevance; certainly all of the chapters could conclude on a similar note (with relevant substitutions) to William J. Burling's account of "Marxism": "Even this short and admittedly selective survey demonstrates the essential interconnection between sf's representations of the production and consumption of technology and the resulting implications as theorized by Marx and later Left thinkers" (p. 245). Now, it might be argued that Marxism forms a special case amongst theoretical perspectives because virtually all SF entails the production and consumption of technology in some form. However, Burling is going further than this to argue that much SF is implicitly or explicitly Marxist or socialist in its implications. To which end, he convincingly discusses work by Kim Stanley Robinson, Iain M. Banks, Ken MacLeod, China Miéville, Tricia Sullivan, and Gwyneth Jones in his closing paragraphs alone. In particular, it is undeniable that "British sf, ever since the days of Wells," as Paul Kincaid notes in his earlier contribution on "Fiction since 1992," "has commonly expressed a left-leaning perspective" (p. 179). However, another way of expressing this persistent tendency of almost all SF can be found in De Witt Kilgore's identification of "spaceflight as the key to fantasies about changing the social and political realities of human society" (p. 189), which is described by Isiah Lavender III in his account of "Critical Race Theory." Lavender, and Kilgore, are focusing on "examples of an idealized human future where race can be imagined positively or at least differently" (p. 189), but the same fundamental impulse underlies SF's attraction and importance to all theories of emancipation. As Veronica Hollinger suggests in "Posthumanism and Cyborg Theory": "one history of sf is the story of the end of 'Man' as the unique human(ist) subject" (170). In "Queer Theory," Wendy Gay Pearson asks: "If sexual difference is the question for our times, it is therefore a question for sf, but one might also ask whether it is a question of sf . Is the meaning and 'identity' of sf constituted by its various crossings over this particular question?" (p. 300). After detailed analysis of Ursula Le Guin's The Left Hand of Darkness (1969), Candas Jane Dorsey's A Paradigm of Earth (2001), and Joy Parks's "Instinct" (2006), the question is emphatically answered by her closing call: "bring on the lesbian, gay, and bisexual vampires, and the queer blue aliens" (p. 307). Reading these sections, it quickly becomes apparent that not only is theory allowing the full implications of SF to come out, but also that SF is a much more complementary partner for theory than mainstream literature: SF texts are already as weird and abnormal as anything that can be read into them. In her chapter on "Cultural History," Lisa Yaszek provides a useful summary of the relationships between different generations of SF scholars and literary and critical theory, noting how both disciplines are opposed to "the three major distinctions informing traditional liberal arts scholarship: learned versus popular texts, production versus consumption, and reality versus fiction" (p. 199). Not only is SF amenable to the anti-traditional stance of cultural history, but it is a form of cultural history itself: "pertain[ing] to everything from the development of nuclear weapons and kitchen technologies to ongoing debates over literary aesthetics and the history of sf history itself" (p. 199). Therefore, it can be seen that The Routledge Companion is as much subjecting theory to SF as SF to theory. For example, Michelle Reid explains that her chapter on "Postcolonialism" shows "how postcolonialism enables a nuanced examination of sf's complicity in and criticism of colonial discourses, and how sf provides ways of imagining futures that counter the argument that postcolonialism looks backward to the imperial centre and colonial past" (257). Fruitful work has been done in this 140 page section and it is incumbent on scholars of both SF and literary/critical theory to build on it in the coming years. But sf can also confront audiences with more difficult, ambiguous conclusions, as with Joanna Russ's The Female Man (1975): "Now the moral of this story is that all images, ideals, pictures, and fanciful representations tend to vanish sooner or later unless they have the great good luck to be exuded from within, like bodily secretions or the bloom on a grape" ([New York: Bantam]: 154). Such notions need to be parsed, argued about, and discussed: confronted more than recited, interrogated more than memorized (p. 386). This sounds as though it is taking Russ seriously but is actually deeply problematic. Russ's "moral" is not that of The Female Man as a whole but of Janet's story of the old Whileawayan philosopher, who tells her disciples to "exercise [their] projective imaginations on people who can't fight back" (Russ, 154). In other words, it is a Whileawayan folk warning against philosophical posturing. No wonder Easterbrook thinks it should be deconstructed out of existence: in this context, "confront" and "interrogate" connote neuter. The reader interested in a genuinely radical account of the ethics and alterity of "Feminist sf" would be much better served by the entry of that name by Gwyneth Jones, which can be found in the "Subgenres" section of The Routledge Companion . In her discussion, which includes a beautifully weighted and economical analysis of the consequences of the Tiptree revelation (pp. 486-7), Jones does not historicise the "'feminist decade' of the 1970s" (p. 488) but shows how its material after effects continue to surround us and, in so doing, makes feminist SF into a real challenge: something that confronts and interrogates us, "women, men and shades between" (p. 487, 488). Returning to "Issues and Challenges," we can see that the particular challenge in the case of well-established methodologies such as ethics and alterity, is to go beyond the existing "synergies" (p. xxi), as the editors diplomatically phrase it, and develop the theoretical approach to a point where it would become central to the study of SF. This problem is foregrounded by Joe Sutliff Sanders's discussion of "Young Adult sf," which tries to map out the turf analytically: "In addition to satisfying whatever criteria are necessary for the text to be called 'sf,' [YASF] must also address the real needs and experiences of adolescent and teen readers" (p. 443). The fact that the phrase "address the real needs and experiences of" is employed instead of the more intuitively sufficient "be directed at" is telling; the "real" here masks an amazingly didactic and proscriptive agenda. Anything is allowed we are told, "as long as the literature under consideration is relevant to young readers' real experiences" (p. 444). This is fair enough in the case where a book which would be clichéd from a strictly SF perspective is praised in a YASF context as a good read. It is more problematic when we start getting on to the "problems for new scholars in the field" (p. 447); in other words, how this discipline is going to be policed: "Children's literature scholarship does regularly use the word 'inappropriate' to condemn a book, but only if it uses formatting, narrative strategies, or subtleties that do not match up with the abilities of readers of the age for which the book is intended" (p. 447). Apparently, the "apprentice reader" and what they "can understand, what they often prefer and what their cognitive needs and inabilities are" (p. 447), are known, scientifically proven factors beyond challenge. One size fits all! Sanders should at least be praised for following his argument through to its logical end point. Writing about a New York Review of Science Fiction article, in which Farah Mendlesohn complains about the tendency of YASF to turn inward and so close down the universe for children, he concludes: "Indeed, the mission of YASF might be so different from the mission of sf that there is no reconciling the two" (p. 448). The real challenge here is for SF scholars to abandon the limiting strictures of the "children's literature perspective" and develop a new theoretical approach for YASF. Sanders does, however, provide the beginnings of an interesting discussion of Robert Heinlein and Andre Norton (pp. 444-5) and it would perhaps have been more fruitful if YASF had been included as an entry in the "Subgenres." We live in this world that "feels like nature"—a world of the entertainment industry, advertising, propaganda, and "the daily transformations of everyday experience that occur when populations are compelled to depend on constantly and rapidly 'upgraded' machines and communication networks simple to survive" (p. 371)—and SF is the cultural medium which makes this "empire" habitable by the imagination. That is really the point of SF in academic terms: not only has it become increasingly acknowledged to be, as Luckhurst notes, "a literature of modernity" (p. 403), but also it is becoming increasingly clear that it is the literature of postmodernity or globalising hypermodernity, as Csicery-Ronay Jr. describes it. This is the situation that has triggered the current growth in the field in British academia and it is one that impacts on a traditional field of SF scholarship: the history of the genre itself. Rieder goes on to argue that this heterogeneous, mass-cultural context is far more typical for a genre than the more homogeneous conditions that underlay the "Golden Age" and was indeed reflected by Hugo Gernsback in his choice of stories for the first issue of Amazing Stories . Therefore, when the first three chapters of The Routledge Companion are considered together, we see a complex account of prehistory, Wellsian moment, and posthistory which collectively describes a process analogous to that outlined by Georg Lukács in The Historical Novel (1937): the development of a genre distinguished from what had preceded it by the conscious employment of a technoscientific sense which, despite fluctuations in its capacity to register its own content and the consequent processes of renewal, remains the most potent form of cultural intervention in the mass societies we inhabit. As a result of its success in opening up the field in the manner described above, I am convinced that The Routledge Companion will prove indispensable, and worthy of shelving alongside John Clute and Peter Nicholls's Encyclopedia of Science Fiction (1993). With three of the four editors and many contributors working in the UK university system, it is also a landmark for the academic study of science fiction in Britain, which has lagged behind North America in this respect. In recent years, however, the number of British SF university courses has grown, the number of PhD applications in the field has increased significantly, and there are now academics holding SF-titled positions. Following recent key British academic books such as Edward James and Farah Mendlesohn's Cambridge Companion to Science Fiction (2003), Adam Roberts's The History of Science Fiction (2005), and Roger Luckhurst's Science Fiction (2005)—a work that has quickly gained canonical status to judge from the number of citations here—the appearance of a work of the scope of The Routledge Companion represents confirmation that SF has incontrovertibly established itself within the walls of UK universities. The doors are now open: we can expect more publications, more courses, more conferences, and more full-time SF academics over the coming years. Nick Hubble lives in Brighton and lectures in English at Brunel University. While I'm sure that this is a good example of the genre (particularly the YA stuff) I'm really not sure as to what purpose these kinds of books actually serve. They're clearly modeled on companion and compendium texts that are designed to serve as text books for popular types of undergraduate courses. But while there has seemingly been an explosion in these types of courses, they're still not as popular as something like "The Philosophy of Mind" or "International Relations theory" and so I'm surprised that there's a demand for them. Also, these types of text tend to go through the motions of touching upon historical and thematic distinctions because of the existence of a historical progression in thought. For example, in the field of IR companion texts start off by dealing with realism then they branch off into the other theoretical arenas before conclusing with the major break points of the contemporary academic scene. But in the field of SF writing, there is no such canon and there is no such theoretical progression. Yes, SFS has traditionally been quite Leftist and there is a gloriously robust tradition of feminist SF criticism but beyond that we're dealing with individual people producing individual papers here and there aren't we? and what determines who gets included and who doesn't? Another aspect of this is one touched upon by Adam Roberts in a recent piece on his blog. He points out that much SF criticism tends to be formalist or structuralist in nature... and yet these approaches hardly ever get mentioned in this kind of book. So clearly, I think the implication (implied by association with the genre of book rather than claims made by any of the people involved naturally) that these types of books represent a 'state of the nation' strikes me as bizarre and demonstrably untrue. So this suggests that this type of book, when written about SF, is trying in some way to 'set the agenda' for how people should think about SF. Is the suggestion that Sf criticism needs to be more theoretical than it is and we are being offered exemplars? If so, then I think that the case needs to be made and if the purpose is to improve the level of debate then surely a more basic book written from a structuralist and formalist perspective would be preferable as it could explain academic thinking on genre and how it is that metaphors and symbolism actually work. Of course, the other option is that these types of articles are merely 'interesting' and that hey... a publisher was offering a bit of cash so that critics could get paid AND chalk up another publication. Which is fine but given how many other books of this kind have appeared, it would have been nice to try a slightly different approach. Sorry if this is rather incoherent and rambly but these types of books really puzzle me. Jonathan: you don't add, though you could have done: and none of it is written in Latin. Nick is at a conference at the moment, and then on holiday, so he may be slow to respond to any comments here (I'm not sure how much he'll be online). For myself, I'll just say that as I understand the review, asserting the value of a theory-based approach to sf criticism is precisely what this book (though not other, similar companions) is doing. Whether or not it builds the case in the way you would like to see, Jonathan, or the detail you would like to see, I don't know, obviously. I'll also note that in terms of market, this edition of the book is staggeringly expensive, and so presumably aimed at libraries; but there is a much cheaper paperback edition planned for next year. I do wonder whether there might be a place for a similar enterprise published online. My impression is that the articles in this one, for instance, are at least relatively accessible, such that they will be of interest to more than just salaried scholars of sf. a. Reading lists. While they don't explicitly include reading lists with articles, a lot of stories are mentioned in articles; I've been looking at them as sub-genre defining works. I've posted 3 lists derived from its articles, along with download links where available: utopian fiction, dystopian fiction, & apocalyptic fiction. b. Occasionally, they do illuminate - at least for the novice. Utopian fiction appears different since I read their article: literature that either contrasts a specific society against an imaginary "better" one, or is a feminist utopia. Nick - thanks for the review. Jonathan M - if you work out the hourly rate for writing (and editing) these things, the cash on offer is tiny. And my work on this, including my chapter, did not constitute research for the powers that be in my institution. I'd probably have to invoke the dreadful thought that we do it for the love of it. I'd hate it if this Companion sets THE agenda - when editing it I was struck how the centre of sf crit was accelerating in all directions away from me. Not that I feel old hat, but that there are all kinds of people writing about *our* sf and it's too complicated to be encompassed in one story (as the forthcoming Fifty Key Figures in Science Fiction should hopefully prove). As to state of the nation - I've lost track as to how many years passed between commission and publication, although not that many. But now is always a moving target. We note in the Introduction that some of the chapters in Issues and Challenges would likely end up in Theory in future editions; YASF would more likely move to History, as the Subgenre chapters are something like half the word count of the others. Personally, I think there is an sf canon - of half a dozen films and a dozen authors/works. But certainly this needs to be resisted. I think my problem with these kinds of books is that I'm not sure what I am supposed to do with them. Yes they're interesting. It's always interesting to read well written and insightful piece about works of SF but given the title and the expansive list of topics, it seems to me that the book is more than just a collection of cool pieces of Sf-related writing. So if they're not just interesting then presumably they're addressing some need. Some lack of knowledge or expertise. I think my problem is that I am used to these types of books being used as textbooks in an academic context. If someone tells me to go out and buy a companion to the philosophy of mind then I expect it to give me what I need to know about that topic. But what do these types of books give me? Andrew says that SF crit is accelerating away from him. A look at places like NYRSF and Strange Horizons suggest that theory is still largely ignored by the bulk of the people who write about works of SF (if not the elite). Even SFS still features quite a few non-theoretical pieces. So it doesn't seem likely to suggest that these types of books equip us for understanding what SF fans are saying about SF. Is it perhaps then a bridge to academic criticism as applied to SF outside of Sf-related publications? possibly but in my experience the accessibility issues in those types of pieces are not that one can write about SF from a feminist or a queer perspective, it is knowledge of works of feminist and queer theory... so a better bridge would surely be introductions to theory? For example, the other day I came across a theoretical term I was not familiar with. It was Deleuze's idea of a Time-Image. It was applied to one of Ozu's films. In order to understand the articles I found I needed not a general piece about theoretical perspectives on Ozu but an introduction to the philosophy of Deleuze. Siilarly, if I wanted to write a piece about a book that was informed by Theory then surely I would be better off being given a reading list of theoretical works as opposed to relying upon pre-digested concepts taken from general pieces about entire fields of SF. So if these types of books are to provide a bridge to SF-related academic criticism then I'm not sure how useful they are likely to be. I'm just not sure whether these kinds of books are supposed to be interesting, whether they're supposed to improve what does get written about SF or whether they're supposed to allow the layman access to theoretical works that they might otherwise not understand. This is in no way a criticism of Nick's review (which I enjoyed) or of the book (which I am sure is full of excellent pieces), it's just that I'm not sure what to do with the information contained within it other than be entertained by it. In contrast, if I pick up Rhetorics of Fantasy I know that I am reading a theoretical work that provides me with first-hand theoretical tools (as I might get reading Deleuze). If I pick up Paul Kincaid's collection or those of Clute I know that I'm to be entertained and occasionally enlightened. If I pick up a work on a specific author I know that I'll learn a lot more about the works of that author. What I get out of this kind of book is much less obvious to me. Jonathan, the point I was trying to make is that it is not just 'this kind of book'. For a start, I don't see it as an 'introduction' or a 'begginner's guide'; the articles are not by and large 'pre-digested' but substantive arguments and contributions which talk to each other. As Niall points out, the price makes it a library book for the meantime but it was actually a good read cover to cover and I got an enormous anount out of it, which I am still digesting (but at the level of reference tool, I now know where to go to find out what I want about a range of topics). I think it is an amazing achievement to produce a book that covers where the academic field is at. And I'm not prepared to apologise about being an academic - there's nothing elitist about working in a mass higher education system or about books aimed at that field. In that context, what I was trying to say about the book being a landmark was intended to reflect (a) my perception that a book of this scope would not have been acceptable to an academic publisher ten years ago and therefore the fact that it now is tells you something about the way sf has grown in British academia (the book being a Routledge UK commission) and (b) that I think it makes the best joined-up case for not just the importance of sf as a field of academic study but for its absolute centrality to understanding the world we're living in at the moment. A single-authored book (and yes, generally, I too prefer to read works of singular, original vision) would not be able to achieve the effect that I think is achieved here. The book is not a monumental, closed bible but it has in my judgement made the case (or depending on how one philosophically models how things happen in the world: it reflects the case) for academic sf incontrovertibly and we can use it as a jumping off point for pushing on. It hasn't set the agenda, it's opened the agenda ... I think if we come back in ten years, we'll see that the things I suggest in the final paragraph have come to pass (assuming the HE sector isn't completely dismantled in the meantime). The idea that this constitutes a state of the nation for academic writing on SF does go some way to answer my question. The rest of the question being more along the lines of what people not writing academic articles about SF should make of those articles other than be mildly interested. But obviously that's a question about the future of SF criticism and would probably merit a book in its own right. As for the anti-elitism thing I must have expressed myself poorly because those thoughts were not for a moment present in my mind.